Go cliff-jumping at Kapena Falls in Honolulu (if you dare). 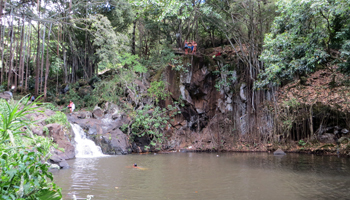 Cliff Jumping at Kapena Falls is Sure to Make a Splash! 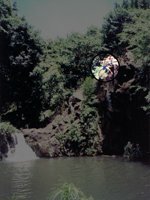 Jumping into Nuuanu Stream’s Alapena Pool from the 35-foot cliff at Kapena Falls was one of my favorite Hawaii adventure activities back when I was a single guy. Several times per year, I’d grab a group of friends and go spend a couple hours hanging out on the rock, chatting with whoever else showed up, and jumping off the cliff five or ten times. It was both relaxing and thrilling – a great way to enjoy free fun activities in Hawaii. 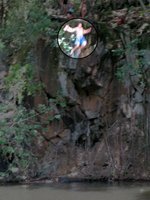 In total, I’m certain I jumped off the rock at Kapena Falls at least 200 times and maybe closer to 250 times. Yet even with all those jumps, 35-feet (approximately 11-meters) is just high enough to be scary every single time. That’s what made it thrilling. More specifically, however, my enjoyment came not so much from the jump as from making the biggest possible splash each time I entered the water. And I’m proud to say that on at least two occasions, my friends up-top reported that my splash shot past the top of the rock in a solid 40-foot pillar of water! You should have seen the bruises I had on my backside from those two jumps… as big and purple as eggplants! Basically, you’ll want to be driving south (toward Honolulu) along the Pali Highway (Hwy 61) between Wyllie Street and Pauoa Road at the mouth of Nuuanu Valley. There is a roadside scenic lookout overlooking the three-tiered pagoda at Kyoto Gardens and the Nuuanu Memorial Park. Pull off the highway and park there. Then walk 150-meters back up the highway until you get to the “SCENIC LOOKOUT 500 FT” sign. At that point, a trail branches off the highway back into the woods and takes you straight to the top of the jumping rock. The actual waterfall is located almost directly below the Pali Highway. 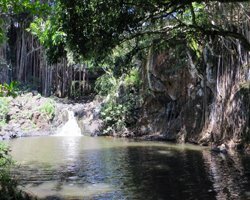 Kapena Falls is a small (approximately 12-feet) and rather unimpressive waterfall spilling into a small, unimpressive pond. There’s often graffiti painted on the rocks and bridge. It’s only somewhat photogenic at best. So if you’re just looking to see a waterfall, go to Manoa Falls. On the other hand, it is very picturesque when you turn away from the falls and admire the banyan trees towering over the pond and stream with their roots cascading down the entire cliff-face. Furthermore, if you walk downstream along the trail on the right side of the stream, you’ll encounter the Nuuanu petroglyphs (prehistoric Hawaiian rock art). Otherwise, this Hawaii attraction is just a place for jumping, swimming, and maybe some outdoor exploring. Don’t leave valuables in your car. There have been times when break-ins were frequent. I’m not sure how bad the problem is at present, but I did see glass from a broken window when I was there in May 2013. Don’t enter the water with any open wounds, and don’t drink the water. 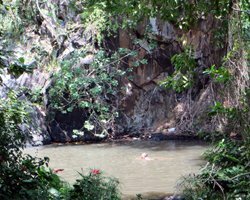 Hawaii’s freshwater streams and ponds sometimes contain leptospirosis (a parasitic bacterium that can be transmitted to humans from animals through infected water). The incubation period is usually 4-14 days, and infection causes flu-like or pneumonia-like symptoms that can easily be misdiagnosed, allowing the infection to progress into more severe symptoms such as meningitis, renal failure, liver failure and so on. In short, it’s seriously nasty stuff! Check the water and weather conditions before entering the water. If there has been very little rainfall recently and the pond is looking like it hasn’t been flushed out in a while, I tend to think that maybe leptospirosis (and who knows what else) has had time to accumulate. Whereas, if there's a constant flow of fresh water moving in and out of the pond, I'd think maybe the water is fresher. I have no scientific supporting data for this opinion, but I’ve been in the pond hundreds of times (always when there was a good flow of water), and I’ve never been infected. If you do start to feel sick within two weeks after swimming at Kapena Falls, immediately alert your doctor to the possibility of leptospirosis infection and help yourself get an accurate diagnosis. Always check the water depth before you jump (or make sure you watch other jumpers testing it for you). In hundreds of jumps, I think I’ve only managed to brush my toes on the bottom once. But the cliff is next to a waterfall; and boulders could get washed down into the drop zone with any heavy rain. Keep your legs together and your arms in tight to your body. Trying to parachute your arms out will not slow you down; but it will give you some monster welts! And opening your legs is like getting punched in the privates! Yikes! Don’t hold hands with another jumper. I once saw a couple of girls do this. One girl jumped farther than the other, which pulled them both horizontal for a double belly flop! That had to hurt! Several of us ended up jumping in to assist them out. 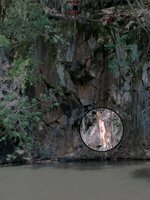 If there is a rope swing dangling from the tree on the left side of Kapena Falls, don’t do it! Though it may seem like fun to swing out and launch into the water, there is way too much room for error on this. I think I did this swing three times (to prove my fearlessness) and it was both terrifying and stupid! One of my friends is lucky to be alive after barely missing (by mere inches) a head-first drop onto the rocks. Disclaimer: I'm not recommending this activity. I'm just giving you information about it. Nevertheless, stupidity and carelessness can still kill you. Use your brain and take responsibility for your own safety. Know the limits of your ability and stay within them. Don’t give in to peer pressure if this is beyond your ability. Just volunteer to take the pictures, and live to happily enjoy another Hawaii vacation day!